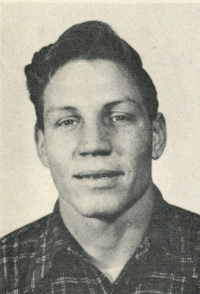 Obituary – Bailey, Byron Blake « Perry High School Alumni Association, Inc.
﻿Football ’44-’47; Football Co-Captain ’45-’47; Basketball ’44-’47; Jr. Play ’46-’47; Perryscope ’46-’47; Senior Class Pres. ’46-’47; HR. Class Treas. ’45-’46. Byron B Bailey, 85, formerly of Evansville, Indiana, passed away Monday, November 10, 2014, in Maracaibo, Venezuela. Byron was born in Phoenix, Arizona on July 3, 1929, to the late Tipton Bailey and Minnie (Blake) Bailey. He was proud to have served in the United States Army and was a mechanic by trade. He is survived by his three daughters, Linda (Loyd Enochs) Latouche, Sandra (Andres) Chaparro and Barbara (Simon) Vargas; grandchildren, Brian, Gena, and Patricia Latouche, Adelmo, Andres and Daniel Chaparro, and Simon Vargas; and six great-grandchildren. Byron is preceded in death by his parents. There will be a memorial mass service at Nativity Catholic Church Friday, November 15, 2014, at 11 a.m. Friends are welcome to attend.